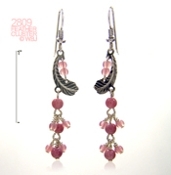 It doesn't get much prettier than our delicate pink Feather Cluster Earrings! Featured here in a rhodium (silver) finish with sterling silver earwires. They are also available in goldplate with 14k gold-fill earwires.